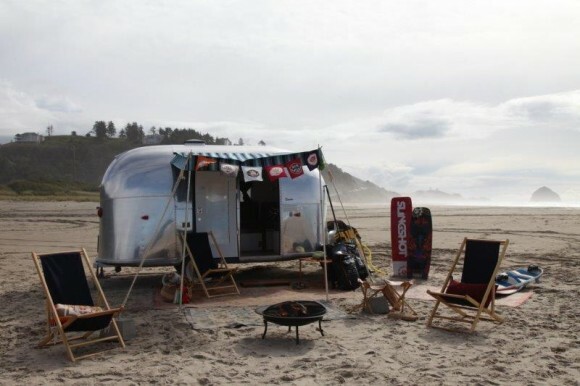 A-frame pop-up trailers are great alternatives for outdoors lovers. Tent campers are the new breed of RVers who are taking to these small collapsible solid-walled rigs, which set up much faster than a tent with no more sleeping on the ground. 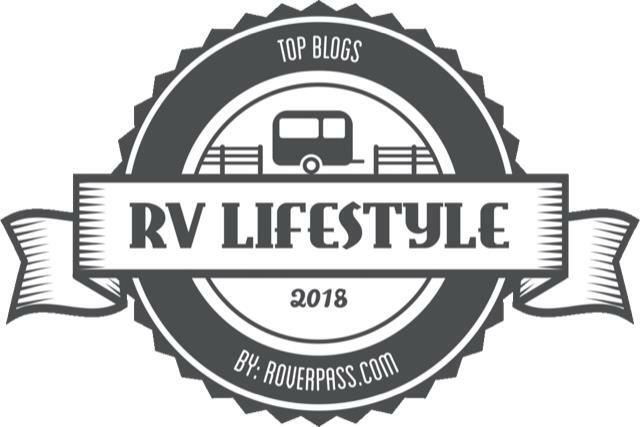 “We had been tent camping for more than 20 years and we finally decided to get an RV when we moved back to Texas,” said Kurt and Shelley Egli of Austin. They selected a 2016 15-foot Aliner Classic Special Edition because of its small, yet roomy size. The tidy living space is 12-foot square. “We love that it has everything we need — sink, stove, microwave, bed, AC, heater and table.” Its gross vehicle weight rating (GVWR) of 3,000 pounds is easily towed with the Eglis’ 2017 Jeep Rubicon. According to Aliner, only 84 of its Classic Special Edition are being produced as a commemoration to the company’s founding in 1984. The retro-influenced design features trendy 1980s colors, a streamlined porch light design, and tires with chrome moon hubs. 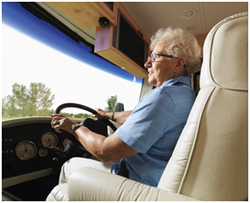 “We wanted an RV so that we could camp year round in Texas,” said Egli. In comparison with the porous canvas tent trailers, the completely enclosed air-conditioned space stays cooler during hot and humid summers. Kurt and Shelley are competitive ultra-marathon runners and favor camping in state and national parks where they can do long-distance training runs. When it comes to staying on public lands, the A-frame is a wise choice because of their small footprint. 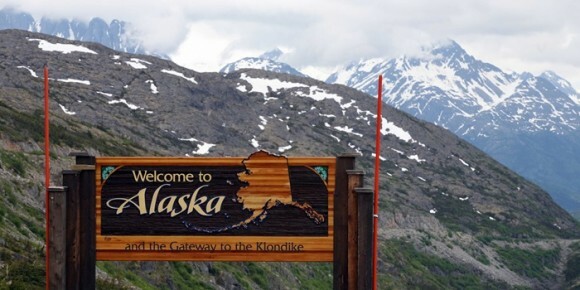 The next post in this four-part series will talk about how retirees Linda and John Keltgen downsized to a folding A-frame because of its ease of towing and set up. To read other posts in this series on ‘Folding A-frame trailers,’ click here. 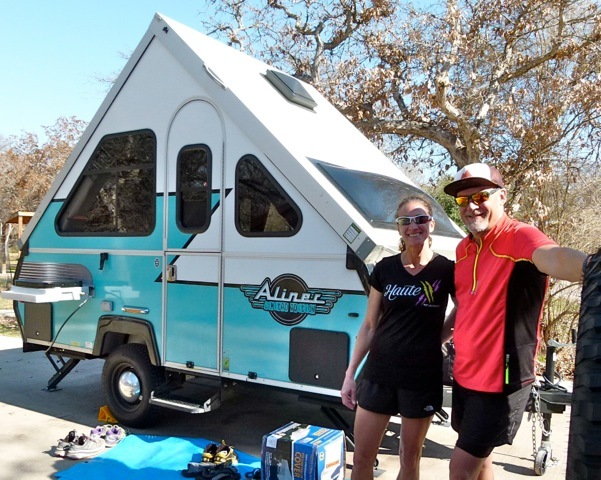 Photos: (Top) Ultra marathon runners Shelley and Kurt Egli of Austin, Texas, camp frequently in their 2016 Aliner Classic Limited Edition pop-up camping trailer. (Julianne G. Crane). 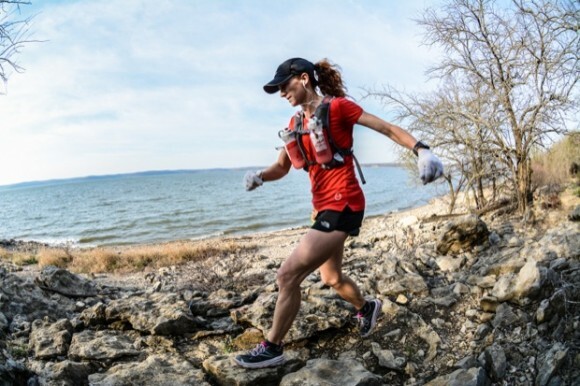 (Bottom) Shelley Egli running a 100k-marathon where she finished first. (Rick Mayo).